On Saturday July 17 the City of Ottawa hosted the second Ottawa ChangeCamp (#cco10) – an event originating in Toronto as a result of the forward-thinking of Mark Kuznicki. ChangeCamp events are taking place across Canada to discuss the evolution of government and citizenship in the modern era of participatory engagement. #cco10 in itself was an excellent example of collaboration between government and citizens, as it was co-organized by a large group of community members and city representatives. The unconference format really empowers all conference participants to be active contributors to the event – participants set the agenda, choose exactly which conversations to participate in, and are ultimately responsible for the content and outcomes of the event. The discussions that I was part of at #cco10 were excellent! Having been to both ChangeCamp unconferences in Ottawa, I think the event format itself is very conducive to the objectives behind the ChangeCamp principles. However, one of the (surprising) shortcomings of ChangeCamp – not just in Ottawa, but across Canada – is the lack of an appropriate online community tool to support each ChangeCamp, encourage ongoing interactions between the F2F events, and to link together the various events happening across Canada. Lots of great ideas are being discussed at these events, and there is huge potential for these ideas to evolve into some remarkable deliverables – especially if each event can build upon the discussions of others. I’ve felt that both Ottawa events have lacked in the online tools to support the event itself. All of the ChangeCamp events are also off in their own space(s), without much integration happening. The changecamp.ca website does try to provide an environment to support ChangeCamp, and this isn’t a criticism of that website. However, I think the series of events have outgrown the existing space (and the original intent behind that space), and ChangeCamp could benefit from an enhanced online community space. The single biggest challenge, and shortcoming of both Ottawa ChangeCamps is the lack of a good online environment to both support the event, and to support ongoing dialogue and interactions following the events. Having recently seen a demo of OPSpedia, I think the tool that they have developed would serve the ChangeCamp community very well. I have made an appeal to David Tallan, Colin Chan, and Darren Chartier to share the OPSpedia code through SourceForge, and would encourage others to do the same. In the interim, how can we enhance, and bring together the disparate ChangeCamp communities across Canada online? The ChangeCamp concept has certainly proven to be successful for the F2F events, and I could see these being regular annual/bi-annual or even quarterly events … it would certainly be easier to organize, and yield far greater ongoing results if supported by a more mature online environment. An important part of my role as a web communications strategist is to stay connected to other practitioners engaged in web communications, social media, web 2.0, etc – particularly in government, but of course there is always value in seeing what’s happening outside of government circles as well. Below are some online and face-to-face communities and groups that I am connected with, and which I feel provide a great way to stay up-to-date with the latest developments in online communications. A facebook-type of online space and community dedicated to connecting government employees from around the world. GovLoop has hundreds (maybe thousands?) of different groups, forums, blogs, etc where participants can share best practices, ask questions, and connect with other like-minded people on issues of common interest. It’s easy to create your own profile, search for “friends” and connect with them, blog, join groups, etc. If you’re not on GovLoop already, I highly recommend joining! This is a less-formal but very beneficial local Ottawa community of government practitioners interested in Web 2.0 use in/for government. Organized by Doug Bastien using Twitter and TwitVite (ex: http://twtvite.com/BC-GA) this group meets regularly to discuss a variety of issues related to web 2.0/social media use in government. Focus tends to be on federal government, but there are many issues that apply at the local level. The W2P community has also organized an annual (free!) full-day networking event for the past two years. I attended the event this year, and it was on-par with conferences organized by ALI and the Conference Board – each of which cost > $1000 pp. Well worth connecting with #W2P on twitter and going out to their meetings and events. Ok so this isn’t a community, but rather a very active “connector” in social media for government, and definitely someone to connect with! Follow Nick on Twitter, and read Nick’s blog to stay in the loop on the latest trends and happenings (particularly in Ottawa) around web 2.0/social media and government, and government transformation. While not focused specifically on government, the Third Tuesday Ottawa Meetups are about bringing together people in a F2F venue from Ottawa to discuss communications and marketing. Many of the speakers and topics in the past have focused on social media use and web 2.0, and have been presented by government employees. Worth joining the group and keeping an eye out for topics of interest. Monthly F2F events aimed to make technology accessible and interesting to all age groups and all people, particularly women. The dinners are always held in pubs, bars or restaurants and there is usually a speaker (or several) who talk for a short while on a chosen subject for the evening. I’ve never been to one of their events, but have heard great things about them! I’m sure I’ve missed lots of other great communities, groups, networks worth mentioning – please share your examples of local Ottawa F2F and online groups. There are many great examples of governments taking the initiative to share their public data openly. It’s not a simple matter of just put it online – in order to be useful to people, the data must be (1) appropriate types of data; (2) available in usable formats; (3) owned and maintained by someone – as a reliable data source; and (4) used to create things that are useful and usable to people. This involves a set of polices, guidelines, procedures, roles and responsibilities, and best practices to create an effective open data initiative. Here are some examples of the current state of open data initiatives in a variety of governments – I’m sure there are many other great examples missing from my list, and I’d be delighted to learn about other examples – please share them! Key issues – data needs to have clear owner; maintenance schedule, policies, procedures; common accessible formats; added value is for community to have way to contribute back to the City with app development. Involved a modest amount of prize money awarded to application developers creating new web-based applications that utilized the City’s open data. DC 311 API – allows developers to create application interfaces to interact with the DC 311 call centre. For example, the Facebook and iPhone applications (http://311.socialdc.org) were developed using the DC 311 API. The former CIO of Washington (Vivek Kundra) moved on to work with as the US Federal Government CIO, and quickly established the Open Data initiative http://www.data.gov/ to make public data generated by Fed Gov’t branches available at a central location. One application developed to date is http://www.recdata.gov/ for Federal Parks & Recreation data – it allows you to search by state/activity/etc. One issue/problem with this dataset is that it’s only Federal Level data, so searching for “New York State” and “camping” returns Federal Parks only, omitting any State park information… next step would be to include state & municipal level data into the mix. A pretty amazing collection of datasets is available at http://datasf.org/ including a pretty impressive collection of apps (both web-based and mobile) at: http://datasf.org/showcase/ for example http://www.ecofinderapp.com/ for the iPhone to help people find locations to recycle or dispose of “just about anything”. Excellent City Council resolution in support of Open Data & Open Source. Practical everyday Augmented Reality (AR) applications may be a few years away still, but the potential of AR for everyday applications is big. Especially if you factor in openly available government data. AR is a mashup of a real-world view and external data sources – think of a Heads up Display on a fighter jet, which takes the pilot’s view of the skies around, and augments that view with data about altitude, velocity, etc. Back down on earth, for those of us not flying around in $Billion aircraft, the possibilities are still pretty amazing. Instead of a HUD we have mobile connected devices like the iPhone or Blackberry, both of which have GPS to determine location – important for location-specific AR data mashups. They also have cameras/video to display the “view of reality”; and finally mobile connectivity (Internet connectivity) to live stream data. Now let’s extend the potential of AR across two dimensions – open data; and mobile applications. Governments have lots of data. Lots and lots of data, about lots and lots of different things – much of which could easily be shared publicly (see the excellent collection of datasets on the Washington DC website). Governments do a good job of collecting large sets of data over time. Now let’s imagine sharing all that data freely with the public, in usable formats, centrally located and accessible, and regularly maintained by the data owners to ensure the timeliness and accuracy of the data. What could we do with all this data? Imagine standing at a downtown corner one morning, a free day open to do anything you want. You decide you’d like to go for a swim at a public pool, after visiting the library, then take your dog for a walk at a park, and finally a skate in the evening (without the dog). An AR app could let you find out the nearest city facilities and parks to your current location, their hours of operation, swim/skate schedules, nearest bus stops, schedules and next bus arrival times; and let you mash it all together to create your own day trip plan, complete with step-by-step directions (ala Google Map directions) – all presented through your AR view of reality. Ok, so this could all be done without AR, and perhaps AR doesn’t add too much value other than the bus info. Another example, with perhaps better use of AR… You see some graffiti on a bus stop. You take a short video of it, and tag it with some keywords and upload it to the City’s website (all with the single push of a button from your mobile, using the City Report a Problem App). The City graffiti cleanup team is currently driving around the city with their gear, and your new problem appears off in the horizon on their HUD. The problem is added to their route map, which is automatically updated with the optimal route to fix a number of reported problems. After removing the graffiti, the crew takes a new picture/video, uploads the completion report to the City website; and the citizen receives a notification with pic/video showing the completed work. Now imagine this for potholes, damage, dead trees, etc, etc. People could virtually “tag” problems; and see that others have also tagged a problem; then view when things are fixed. So not everyone has an iPhone – for some bizarre reason. And, honestly, while the iPhone is great, it’s not really the ideal AR tool. How about having an AR feature embedded into your sun glasses, or akin to the HUD on your car’s windshield (ok, perhaps some driver safety concerns there – on the passengers side! ); or using nano-technology, how about an AR-enabled set of contact lenses? The concept is simply to mesh together our view of the real world with data to modify or enhance that view. Once governments release and maintain it’s data openly, it won’t take long for someone to come up with an iPhone app that takes advantage of the data, and the technology of mobile devices. What AR app would you like to see coming to iTunes soon? I’m thrilled to be part of the organizing group for the upcoming ChangeCamp event, taking place Saturday May 16 from 8:30-5pm at Ottawa City Hall. A lot of hard work has gone into the planning of the event from an excellent group of volunteers, and it’ll be great to see the fruits of our labour coming to life. ChangeCamp is an unconference, meaning that the event provides the framework for discussions – the theme, face-to-face venue, logistical support, gathering participants, and rich online media tools & environment – but the actual content of the event is defined and created by the participants themselves. So there are no pre-prepared powerpoint presentations, key note speakers, or diatribes from an ‘expert’ to a passive audience. ChangeCamp is participatory at it’s core. The event depends upon participants’ active engagement in discussions; people taking the initiative to propose and lead discussions; and for a group of people to self-organize around topics and conversations that most interest them. 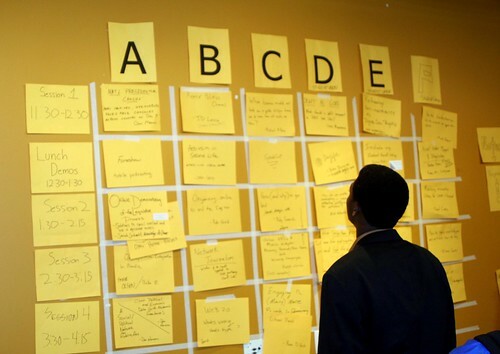 The event framework helps to provide some order to this seeming state of anarchy, by providing pre-defined meeting areas for each of the discussions; and an agenda wall for people to share their ideas, and assign a meeting space and time to discuss their topic of choice. Discussion topic leaders have the sole responsibility of showing up at the time/space to kickstart the discussion; and ensuring that someone facilitates the discussion, and captures and shares the content (it doesn’t have to be the person who proposed the topic). This format is intended to encourage people to come together around specific topics of interest, and to allow people to free-flow around the conference between various conversations and topics to share ideas between groups for a cross-pollination effect. Participation is key, but it’s not only about the event-day participation among people at the event. In this Age of Participation the online discussions and interactions are equally as important. The event participants have been interacting online using a Pathable online community space, and of course through Twitter with the #cco09 hashtag, and the organizers have utilized Google Groups and a wiki space. The event day will see an explosion in online content, through regular tweets, live blogging, Flickr photos, YouTube videos, and the extensive use of the community wiki to capture notes. There is also a FriendFeed stream of content, and a NetVibes page to aggregate the different online content. Hopefully this will help people unable to attend the live event to follow along; and help the event extend beyond this single day to continue the conversations, and drive people to act upon some of the ideas generated at ChangeCamp. It’s great to bring together this group of like-minded individuals for some interesting discussions; but I’m hoping the real value will be in actions following the event that will improve the way governments and citizens interact.